Since 1917, when a cheerful Salvation Army lassie handed a fresh doughnut to a homesick doughboy in France, the Salvation Army doughnut has symbolized loving concern for those in the armed forces. In 1917, young Helen Purviance, an ensign in The Salvation Army, was sent to France to work with the American First Division. She wanted to provide a snack for servicemen. Putting her ingenuity to work, she and a fellow officer, Ensign Margaret Sheldon, patted dough by hand, but soon employed an ordinary wine bottle as a rolling pin. Since they had no doughnut cutter, the lassies used a knife to cut the dough into strips and then twisted them into crullers. Soon the tempting aroma of frying doughnuts drew a lengthy line of soldiers to the hut. Standing in mud and rain, they patiently waited their turn. Although the girls worked late into the night, they could serve only 150 doughnuts the first day. The next day, that number was doubled. A while later, when fully equipped for the job, they fried from 2,500 to 9,000 doughnuts daily, as did other lassies along the frontline trenches. After several soldiers asked, “Can’t you make a doughnut with a hole in it?” Ensign Purviance had an elderly French blacksmith improvise a doughnut cutter by fastening the top of a condensed milk can and camphor-ice tube to a wooden block. Later, all sorts of other inventions were employed, such as the lid from a baking powder can or a lamp chimney to cut the doughnut, with the top of a coffee percolator to make the hole. 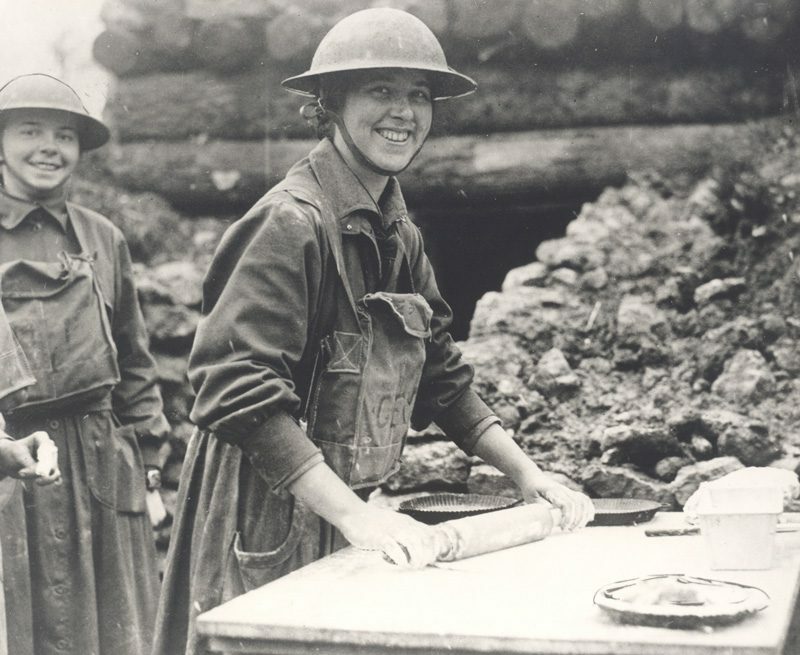 The soldiers cheered the doughnuts and soon referred to Salvation Army lassies as “doughnut girls,” even when they baked apple pies or other treats. The simple doughnut became a symbol of all that The Salvation Army was doing to ease the hardships of the frontline fighting man–the canteens in primitive dugouts and huts, the free refreshments, religious services, concerts and a clothes-mending service. The Salvation Army in Hoonah, Alaska, is still serving the doughnut today. At Lil’ Gen’s Doughnuts, Salvation Army personnel make and serve fresh, hot doughnuts to residents and cruise ship passengers from a repurposed shack near the dock. Doughnut flavors include everything from traditional sugar doughnuts to a spicy dunker flavored with sriracha chili sauce. See it in action and share it with a friend at helpsharechange.org. Read more: Download a free digital copy of “Doughnut Sweethearts” on Frontier Press.